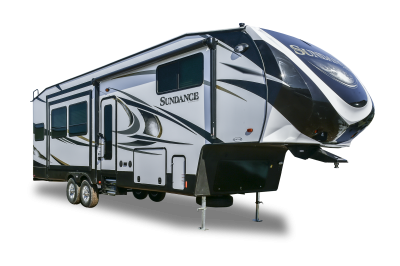 SUNDANCE S7 by Heartland Recreational Vehicles combines luxury, comfort and spaciousness to provide you with a high end fifth wheel at a mid profile price! Wide-open layouts are enhanced by our curvilinear ceiling giving you and your family a taller, more open, residential living space to relax and enjoy. Choose from a variety of multiple slide-out floorplans, including many offering the ultimate in interior spaciousness. 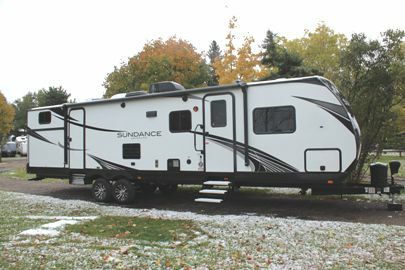 Whether you are entertaining guests, prepare a large meal, or just want to enjoy camping without feeling confined, SUNDANCE S7 provides the answer time and time again! S5 Lighter Weight. Full Featured. Whether you are looking for a 1/2 ton towable or are just tired of hauling around and maintaining a larger luxury unit, SUNDANCE S5 answers the call by providing you the luxury amenities of our top selling SUNDANCE S5 in a smaller, lighter, easily manageable, laminated, fifth wheel. From single slide couples coaches to triple slide units with bedroom slides, S5 provides multiple possibilities to meet your exact camping and travel needs.